Darjeeling: It was 1948 when first Land Rovers had rolled into the 'Queen of Hills'. A strong bond ensued between the two. Many years later, the bond strengthened with Darjeeling's Samantha Dong becoming the first lady instructor for Land Rovers certified by the company in India. It was in December 2017 when Samantha had taken part in the Teesta Rangeet Festival in Darjeeling. A Land Rover rally was part of the event where 42 fighting fit Series I and II Land Rovers were taking part. Samantha was driving her Series - IIA Air-portable Land Rover. Asish Gupta, the only Lead Instructor of the Land Rover company, who was also taking part in the rally was quick to spot Samantha. He offered her to come to Chandigarh and try for the Instructors certification. Samantha, a Masters Degree holder in Public Administration found herself in Chandigarh in April 2018 where she appeared for the online examinations. "I have a team of 21 instructors in India. Samantha becomes the first lady to clear her Level 1 in India," stated Asish Gupta, the lead instructor, Land Rover, India while talking to Millennium Post. Land Rovers run in the blood of 29-year-old Samantha Dong. Her grandfather used to drive a Land Rover as a livelihood, making the arduous trip from Manyebhanjyang to Sandakphu (the highest point of West Bengal at an altitude of 1200 ft), ferrying both passengers and goods. "Inspired by my grandfather, I started learning to drive at the age of 7. However for the past 10 years, I have been driving the Series II Land Rover that belonged to my grandfather and our family owns," stated Samantha. 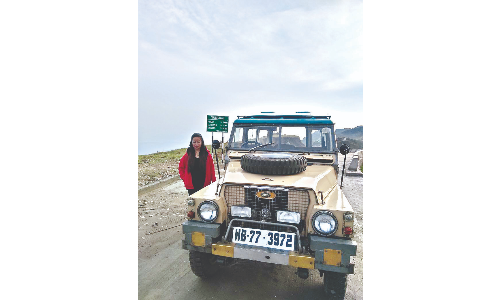 Samantha is the only lady driver who drives up to Sandakphu (around 60km) in her vintage Land Rover negotiating the steep terrain and the hairpin bends. "I am lucky that I got the opportunity to make a career out of my passion for driving. I want to clear all the levels and training with Land Rover and become a Lead Instructor," stated Samantha. Recently the 70th anniversary was commemorated at Maneybhanjyang, a sleepy hamlet, 28 km away from Darjeeling. The hamlet still boasts of more than 40 fighting fit vintage Land Rovers ferrying passengers and essential commodities to Sandakphu, Phalut and neighbouring areas. There were two Land Rover teams, one from India and the other from Solihull near Birmingham, England. Samantha was a part of the celebrations and drove both her own Land Rover and the All New Discovery Land Rover. "The new land Rover is fully automated. The drive quality is much better. However, I love the charm of the vintage Land Rover. With everything manual, it is a tough challenge," added Samantha. The English Land Rover team had shot three documentaries as a part of the celebrations including one featuring Samantha and her family. "My father had 9 grandsons and grand daughters. None of Samantha's cousins drive the Land Rover. I taught her driving. She has excellent car control," stated Kiran Dong, Samantha's father. The Dong family has been very supportive. "Sometimes it's very scary to see Samantha negotiate the hairpin bends. One miscalculation would mean death. However, I have never allowed my fear to interfere with her passion," stated Manzil Shuprabha Dong, Samantha's mother. Samantha wants to take part in driving expeditions including the Himalayan Dash and the Desert Dash. "I want to drive to Ladakh in my Land Rover," added the dreamy eyes Samantha. From 1948 to 1954, the Government of India had imported around 2,000 Land Rovers to be used in various departments throughout the country. The Land Rovers soon became a status symbol for the people who took pride in their work. It was 1948 when first Land Rovers had rolled into the 'Queen of Hills'. A strong bond ensued between the two. Many years later, the bond strengthened with Darjeeling's Samantha Dong becoming the first lady instructor for Land Rovers certified by the company in India.